Regularly I am asked about my panniers. Most of the people have never seen them or even heard of them. As usual I do a lot of research before choosing equipment and the type of panniers to use are often a discussion subject over a beer on the camping fire. So why did I chose the Acmezoom Mule Pack Panniers over aluminium panniers or softbags? What about the other type of panniers? 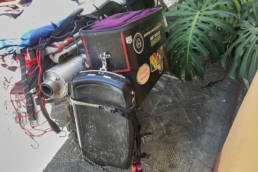 Continue reading to learn about my decision which to get and my review of the Mule Pack Panniers. I’m sharing with you my experience with the Mule Pack Panniers on and off the road. One big advantage ov hard vs. soft panniers is that you can lock them. The locks might not be very hard to pick, and if someone wants to get in our stuff he will. It’s more against occasional quick thievery on gas stations or while quickly going into a store or hotel. Then there are softbags. I like them as well and they might be a really good choice if you plan to do a lot of offroading. Since they are soft, they won’t hurt your calves that much when putting your foot down. 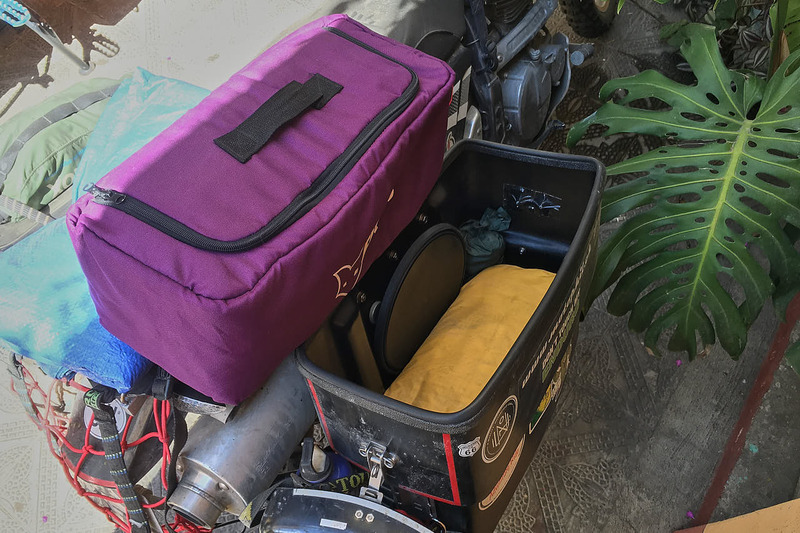 They are usually more compact than hard panniers which can help to keep the weight more centered and be useful when lanesplitting. They are easily adaptable to any bike. You don’t need special racks and mounts to fit them, just any rack will do to keep them away from the wheel and exhaust. This could come in handy if you plan to switch bikes on your trip, either because you have to or because you plan to get another bike on your next continent. They are easy to lug around, just hang them over your shoulder. I suggest to get softbags which have a seperate inner drybag. 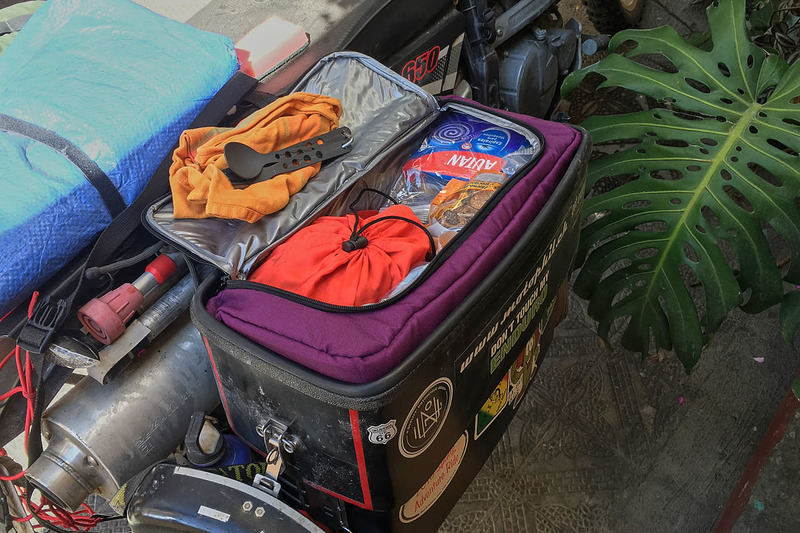 This makes it easy to carry stuff to your hotelroom, you can use the drybag for other things, like as a cooling bag if you put ice in there, and you can easily replace the drybag if it’s beyond repair. Then you don’t need to worry about complicated repairs of the outer material, just have it stichted back together (be warned doing it yourself, strong cordura material is extremely tough to get a needle through) or patch it up. I would also look for some with straps/daisychains to be able to attach other small bags or bottleholders to them. Bottles take an aweful lot of space away in the bags and they usually don’t mind to get wet. ATG Softbags on PikiPiki's DR650's. Probably the biggest disadvantage is that they are not lockable. But I have met so many travellers with softbags never having issues with occasional thievery. One couple I met had their tent stolen in Mexico when they had to leave their bike on the street for the night. But in such a situation I even take out my stuff from lockable panniers. They had to admit that it was their own bad being to lazy to bring everything to the hotel room. Adventure Spec Magadan soft panniers are apparently cut proof but I haven’t got any feedback on those. Hang around for Turkana Gear Saddlebags. My friends from PikiPiki who have spent years on and off the road will soon present your their improved saddle bags all based on years of experience. There are options available like those from Givi and other brands. Those were not an option for me. 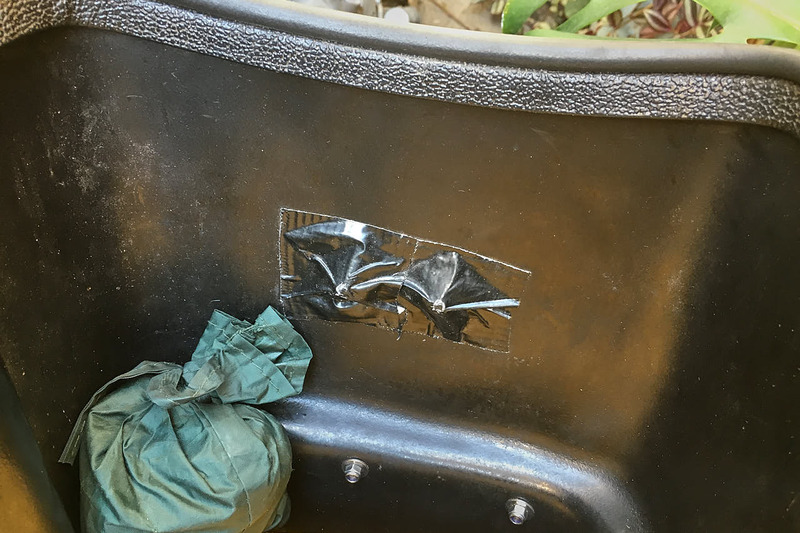 Plastic boxes can crack or break apart on impact and this is not something that easily fixable on the road. 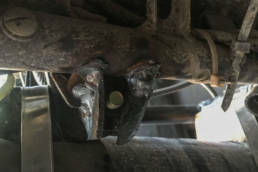 Yes you could maybe use duct tape or something like JB Weld but it would be just an even weaker point on the next fall. I had the BMW plastic panniers on my GS and once the GS fell over (from standing, not while riding) and the panniers actually got cracked close to their locking mechanism. Also I have seen people using Pelicases or other plastic boxes to make their own panniers. But Pelicases are really expensive and I do not have the knowledge or machinery to make my own mounting hardware. So this was out of the question for me as well. Sitting back home contemplating over softbags that are apparently cutproof and checking bagsafe net-cable locks, my friend Pascal got note of the Mulepack panniers, which are made of molded high-density polyethylene. They have a demo video were they put the pannier down on the floor and then drive over it with a truck. It’s being “pushed in” completely but after the trucks gets off, they simply pop back into their original shape! How cool is that? Forward to 1:35 for the destruction test in the following video! Forward to 1:35 to see destruction test! When I saw this I was almost hooked on them. I wouldn’t have to worry about knocking dented aluminium panniers back into shape or about the occasional thievery by having my valuables locked in. Then I could attach stuff like smaller drybags on top of them. Since they are toploaders they are easy to use. I could also drill holes and attach something like bottleholders to them. They come in two sizes, 28L and 38L. I went for the smaller ones as the 38L are mainly higher and that would probably look ridiculous on a smaller bike like the DR. For me, the 28L is the perfect size fit for the DR650. There are different options of mounting hardware, depending on what bike respectively what panniers you are using. Some of that hardware is specifically made to fit DR650 racks like the ones from Procycle or the Moose expedition racks. 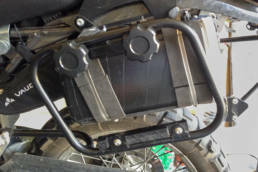 But there is also a universal mounting system which should work on most racks, also like Touratech ones. 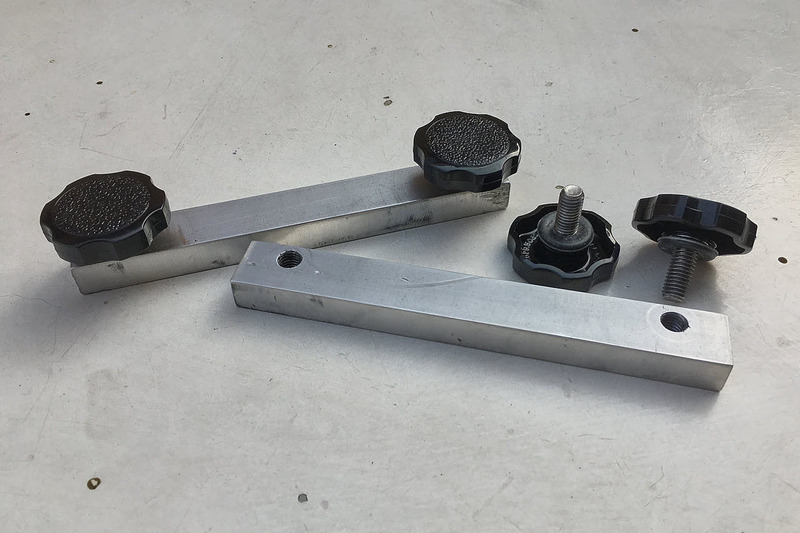 Procycle also offers a new lockable quick realease adapter to fit, but you will need their racks and I cannot say how easily they can be fitted to the Mule Packs. Forward to 2:05 in the follwoing video to see the quick release mounting hardware. I was choosing between the Procycle Moto-Mule racks and the Moose Expedition racks. I think they are both a good choice and the main differences I found in my research was: a) the procycle racks are little more tilted forward/downward and create a perfect line with the DR650. b) the Procycle racks are asymmetric, meaning the left hand side rack is closer to the bike than the right hand one, because the right one has to accomodate the muffler. If you get the Moose racks, which are symmetric (same distance on both sides) it will give you a little more space to mount a bigger toolbox between the left side rack and the bike. Maybe you could even fit a Rotopak there, but not sure if that works. A note on mounting any kind of racks to the DR650: The small bracket on the left side subframe to mount the rack is a weak point. Doing off-road with loaded panniers will make this bracket snap eventually. A friend did a really awesome welding job on this one for me. He plasma cut to little plates and welded them on either side of the bolt threading to the subframe and bracket. I’m sure this bracket won’t go anywere! The mounting on the Procycle racks is fairly easy (see following video). 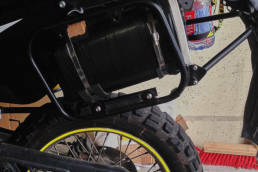 You mount a fixed bar to the lower side of the rack where you will “hook in” the panniers. Then you get two thumb screws and another non-fixed bar to hold them in place on the upper side of the racks. It does work but I do have a few complaints about it. You should use blue loctite on the thumbscrews because they can rattle loose when doing offroad riding. Taking the panniers off and putting them back on several times can harm the thread in the plastic bar, you also need to be careful to put the thumb-screws really straight in there or you will worsen the threads. Once I went down in the sand my pannier fell off, the bolt was just ripped out of the plastic bar and the thread was gone. Since it is plastic I managed to get it back in kind of screwing a new thread in there, but it was a sweat job to do so in the glooming sun and 33°C temperature in the desert of Baja California. 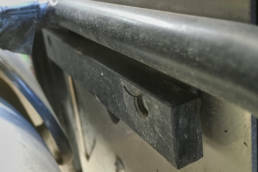 You can always replace the plastic bar with some (self-locking) nuts but you will lose theft-protection and you will need a wrench most likely to take them off or put them on. I just received the new mounting hardware. The mounting bars are now made of aluminium and a little thicker too. I am sure they will do a better job than the previous plastic bars. See pictures below. If you order your Mulepack Panniers you will get the new improved mounting hardware. The Mule Pack Panniers mounting hardware was suffering from my non-existing sand riding skills. 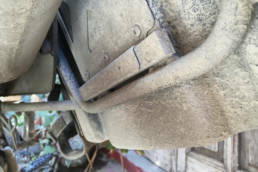 The metal base plate on the back of the panniers has pre-drilled grooves to acommodate various racks. I still had to extend the groove to make them fit my Procycle racks. It would be better not to have pre-drilled grooves and just have yourself drilling the wholes where you need them. This would also add to the strength. 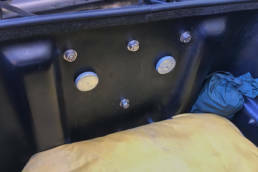 Sliding with your bike and panniers over the road will make the bolts move along the pre-drilled grooves and make the drilled whole in the plastic behind become a groove as well. I also added blue Loctite to all bolts that do not have locking nuts. Most of the bolts and nuts are metric but the tiny allen bolts which hold the plates around the grooves for the top cover straps are not. So I had to find someone with non-metric allen keys first. I am not sure about the strenght of the locking mechanism. I feel that it could be easily bent open with a screwdriver, though I have not tried this. But again it serves the purpose agains occasional thievery well enough. My panniers came with rediculous large thumb-screws, they took a lot of space away in the panniers. I replaced them with smaller ones found in a Home Depot kind of store. My friends’ Mule Packs came with much smaller thumb-screws, so they must have changed that since I ordered them earlier. Along with the new improved aluminium mounting bar I also received new and smaller thumbscrews. They have a rubber seal and are much smaller and hence will occupy less space inside the panniers. See pictures below. Those will come with your new Mulepack Panniers. The new and improved Mulepack Panniers Attachment Hardware. The aluminium bar is much stronger than the old plastic ones and the thumbscrews are now low profile and sealed. Mounting bar on the lower side of the Procycle racks. The upper plastic mounting bracket, one of the weak points of the mounting system in my opinion. However the panniers now come with an improved aluminium bar instead. In my left pannier I carry various things packed in little bags. The Fuxtec cooling bag has a perfect fit in the upper half of the pannier. I carry my kitchen gear and some food in the Fuxtec cooling bag. In the lower half of the right pannier I carry my tent packed in a sea to summit big river dry bag. I had to cover the nuts inside the pannier with duct tape so it would not tear apart my bags inside any further. When you take off the cover you can easily hang it in the locking mechanism. The provided mounting knobs are ridiculously oversized. But this has been resolved in the newer editions and they come with smaller and sealed ones now. Apart from my mounting hardware being a bit strained the daily handling with the Mule Pack Panniers is easy. They are opened quickly, give easy access to your stuff inside and adding stuff to the top is easy with the included straps or even better with Rokstraps. Instead of having to put the cover on the ground you can easily hang it in the locking mechanism. They have proved to be quite waterproof so far, rain is not a problem at all and even a short dip in a creek doesn’t let too much water in. Only bigger creeks with a stronger current will fill them up quickly as my friends from ERTW had to learn. They can take quite some lugging around your bike on the ground. Hitting stones with them doesn’t hurt them much and when going down with speed you can fix the deeper scratches with a lighter, almost like welding it back together. The new improved mounting hardware seems much more sturdy and the thumbscrews are now sealed and low profile. This will make removal and re-attachment of the panniers easier and I think they can also take more beating than the old plastic bars. The 28L fits the DR very well and I don’t need much more space for my equipment, though I do have to say my equipment has been meticulously picked to be small and lightweight. 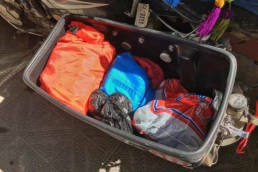 My left pannier holds various stuff like my toolroll, raingear, sleeping bag, sleeping mat and some smaller stuff in little drybags. My right pannier holds my tent which fits nicely in the lower half of the pannier and my kitchen in the upper half. Tip: I found a cooling bag from german company Fuxtec which fits perfectly (really!) in the upper half of the pannier! This cooling bag functions as a perfect inner bag containing all my kitchen equipment. If necessary I could use it as a cooling bag while camping or in a hotel room. 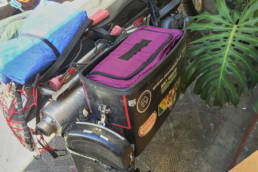 While for heavy offroading I would seriously consider soft saddle bags, if you wanna go the route of hard panniers I would definitely recommend the Mule Pack Panniers, not just for the DR. It’s a great and innovative product and in my opinion a better choice than aluminium panniers or simple plastic boxes. A lot of riders I met were quite interested in them! Once again a helpful write up. Thanks.